German Erik Zabel was the winner of the seventh stage of the Vuelta on Friday – but for a good ten minutes not even Zabel realised that was the case. In fact, the veteran fastman went to the team bus and watched the race finish on tv, only to find that he had been named the winner. The Milram pro was one of a bare 20 riders or so who managed to avoid a mass pile-up two kilometres from the line – caused by roadworks that the Tour of Spain organisers claimed had been started too recently for them to deal with. ?We went round here three weeks ago, and there was nothing going on.? 1998 Vuelta winner Abraham Olano, now working for Unipublic, said afterwards. ?Our apologies to the riders, this must have started since then.? 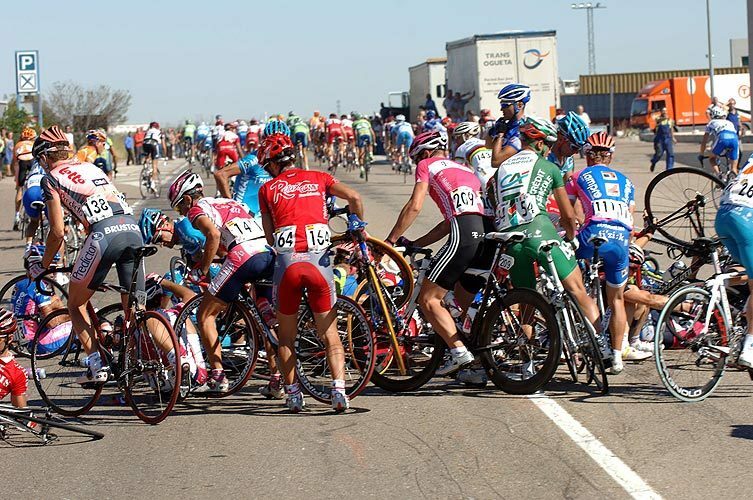 Over 100 riders were blocked in by the crash, amongst them Zabel’s team-mate Alessandro Petacchi (Milram) but fortunately none appeared to have suffered serious injuries. As for three times stage winner Oscar Freire, the Rabobank rider had already opted out of the sprint, saying he knew it would be too dangerous. Zabel?s victory, then, was more than unexpected, with Australian Allan Davis (Discovery Channel) raising his arms in the air as he crossed the finish line. However in fact the German had been slightly faster, sneaking across the left hand side of the finishing straight for the eighth Vuelta win of his career. ?I had a good feeling about the sprint.? Zabel said, ?but I saw Allan had put his arms in the air and thought ?oh well, I was wrong.? ?Then afterwards the tv commentators said I had won. It was a very special feeling, just as every win is now, because after May [when he confessed to EPO use in 1996] I thought my career was over.? Controversially, part of Germany?s long list for the World Championships road race this September, Zabel criticised the UCI?s decision to prevent Alejandro Valverde (Caisse D?Epargne) from participating in the same race. ?It?s very important that every federation and the UCI apply the rules, but it?s not good for them to say this or that rider is not welcome. If riders positive that?s when they should be excluded.? ?The problems of doping exist in cycling, but maybe in Germany?s there?s been a bit of an over-reaction. It?s typically German to want to make everything 120 percent good.? he reflected. The Vuelta itself continues on Saturday with a crucial 52 kilometre time trial, one of the longest in the history of the race. Completely flat and exposed, race leader Vladimir Efimkin has recognised that he will face a serious challenge from the experts against the clock, naming Denis Menchov (Rabobank) and Cadel Evans (Predictor-Lotto) as the most serious threats. ?It?s going to be very hard to fight them, but I will do my best.? the Caisse D?Epargne rider commented. As for Evans, despite putting ?just for training? next to the Tour of Spain on his website race calendar, the Australian could be a serious challenger for the maillot de oro on Saturday. ?It?s not a great route for me, too flat and untechnical, but I?ll do my best.? Evans, who will check out the route on Saturday morning, said. ?Menchov will definitely be one to watch.? ?We?ll be treating this just like it was a time trial in the Tour de France.? Predictor director Hendrik Redant added. ?We were very pleased with Cadel?s performance in the Lakes of Covadonga, we thought he?d lose three times as much he actually lost. (22 seconds), so let?s see what happens. ?